This article was originally published by the World Policy Institute on 22 April 2015. An April 2 meeting between the defense ministers of Turkey, Georgia, and Azerbaijan might have easily passed as routine. Yet in a region like the Caucasus, fraught with deeply entrenched interstate rivalries, this summit could hardly be described as inconsequential. At the meeting, Azerbaijani Defense Minister Zakir Hasanov identified Armenia as a regional threat, remarking that it “is the only state in the region which lays territorial claims to our countries.” The same day, Russian fighter jets stationed in Armenia began three-day drills. Though these two events probably coincided by chance, they illustrate two distinct – potentially competing – regional orders in the South Caucasus: a deepening Turkey-Georgia-Azerbaijan coordination and a historic Russian presence represented by the Kremlin’s close alliance with Armenia. This month’s Turkey-Georgia-Azerbaijan summit in Tbilisi follows a trilateral meeting held last August in Azerbaijan’s Nakhchivan exclave. At the previous meeting, the three countries agreed to joint military exercises, training, and arms development. While officials insisted on both occasions that their governments were not targeting Armenia, Turkey and Azerbaijan’s mutual enmity toward Yerevan along and Defense Minister Hasanov’s recent comments indicate otherwise. The conference also comes at a time of heightened tensions between Armenia and its Turkish and Azerbaijani neighbors. Armenian and Azerbaijani forces clashed several times this year in the breakaway Nagorno-Karabakh region, including as recently as April 21. Turkey’s borders with Armenia, like Azerbaijan’s, are now closed. The Turkish government sealed this frontier in 1993 as a show of support for Baku. Meanwhile, the Turkey-Armenia normalization process remains derailed. Relations between Ankara and Yerevan are especially strained as the April 24 centenary of the Armenian genocide rapidly approaches. Turkey and Armenia are courting world leaders to attend concurrent commemorations for the Battle of Gallipoli and the genocide, respectively. While Ankara and Baku have clear interests in containing and isolating Armenia, Georgia’s role in the arrangement is far more ambiguous. Tbilisi does not share a history of hostility towards Armenia as Turkey and Azerbaijan do. Georgia does, however, maintain a tense relationship with Yerevan’s patron in the Kremlin. Moscow waged a brief but destructive war against Georgia in 2008, and Russia’s military still occupies the breakaway regions of Abkhazia and South Ossetia. A strong alliance with Turkey and Azerbaijan could create some kind of a counterweight to an aggressive Russia in Tbilisi’s foreign policy. Speaking to World Policy Journal, Dr. Igor Muradyan of the European Geopolitical Forum observes, “Georgia believes relations with Turkey and Azerbaijan could create a balance.” Tbilisi is in an especially vulnerable position because of Russia’s continued hold on two regions in northern Georgia. Ankara and Baku are better placed to offset Russia’s regional hegemony. Turkey is a major military power and Azerbaijan’s armed forces are reinforced by an ever-expanding defense budget supported by the country’s significant energy wealth. Though Turkey and Azerbaijan are mostly concerned with Armenia, the nascent tripartite bloc may ultimately serve as a foil to the Kremlin’s influence in the South Caucasus. As the Turkey-Georgia-Azerbaijan alliance develops, it possesses the potential to reshape the Caucasus. In the 24 years since the Soviet collapse, no outside actor has taken any real initiative in balancing Moscow’s dominant position in the region. While the United States and Western European governments have proven to be disinterested in the region, Turkey, owing to its proximity, may have a stake to uphold. Dr. Oktay F. Tanrisever of the Middle East Technical University explains, “Turkey, as a NATO member, is a major regional challenge to Moscow.” As a member of the Western mutual-defense pact, Turkey has more concrete support from Washington and European powers than Georgia and Azerbaijan could ever boast on their own. Turkey “wants to play a strategic role in stabilizing the Caucasus, is currently providing educational, equipment and financial assistance to the Georgian military in its efforts to harmonize with NATO standards,” says Dr. Nika Chitadze of the International Black Sea University in Tbilisi. NATO maintains important standards for tactics and quality, which Ankara can pass on to its allies in the South Caucasus. As Turkey, Georgia, and Azerbaijan pursue closer collaboration, Baku is also engaging its southern neighbor, Iran. On April 21, Tehran’s ambassador to Azerbaijan announced the formation of a joint Iran-Azerbaijan defense commission. The move comes a day after Iranian Defense Minister Hossein Dehqan offered military equipment to Azerbaijani President Ilham Aliyev during a visit to Baku. Iran’s overtures are largely unprecedented. The Islamic Republic enjoys warm ties with Azerbaijan’s longstanding enemy, Armenia. Iran and Azerbaijan have also clashed over a number of issues, including Baku’s friendly relations with Israel and Tehran’s regional ambitions in the Caspian Basin. If Azerbaijan and Iran do opt for closer security ties, the realignment may induce a greater Russian presence in the region. With a powerful new patron like Iran, Baku could further isolate Armenia. Yerevan’s weakened state would give its Russian ally a pretext to expand its activities in the small South Caucasus republic. A shift in Yerevan and Moscow’s positions would likely impact Turkey-Georgia-Azerbaijan cooperation, given Ankara and Baku’s interest in blocking Armenia and Tbilisi’s concerns regarding the Kremlin. There is, of course, a limit to the amount of pressure any new regional axis can place on Russia, and by proxy, on Armenia. The long-term vitality of this alliance may prove to be a difficult balancing act for all parties involved. Turkey is a critical transit state for Russian natural gas, and Azerbaijan currently purchases most of its arms from Moscow. While Georgia hopes the territories carved out by the Kremlin will be returned, this is unlikely, and Tbilisi accordingly maintains an uncomfortable peace with Russia. A more assertive Georgian foreign policy could place détente with Russia at risk. 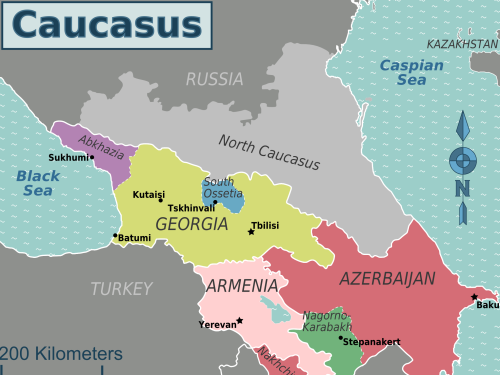 The Caucasus is a corner of the world characterized by tightly-bound alliances and deep-set antagonisms. Ankara and its Caucasus partners will have to balance their regional coordination with each of their own relationships with Moscow. Nevertheless, the emergence of new, trilateral cooperation backed by a major power like Turkey, along with developing Iranian initiatives, have the potential to impact the network of partnerships and rivalries in a traditionally Russian neighborhood. It is nearly impossible to analyze this region statically. A regional realignment is suggested by the author, but this alignment already exists to a large extent. While closer trilateral cooperation may be an attempt at both avoiding a rhetorical “Eastern Ukraine in the Eastern Caucasus” and providing uniform pressure against Kremlin influence, nonetheless, Moscow has wide influence in the region. Perhaps for this reason, encroachment by external powers has limits. One need only observe events in Georgia during August 2008. Of all three states, Armenia doesn’t have sizable minorities. This is not the case in Georgia or Azerbaijan where ethnic insurgencies are potentially destabilizing. A high percentage of non-ethnic Azerbaijanis were sent to fight and die on the Karabakh front and memories last a long time in this part of the world. In the event of even a rekindled short war over Nagorno-Karabakh, Armenia would be wounded, but much of Azerbaijan’s ability to transport hydrocarbons would be destroyed — and not just in Azerbaijan. Neither side would be allowed to gain a strategic local advantage. In addition, with Russian soldiers guarding the Armenian-Turkish frontier, Turkish “military power” would be forced to watch events, as it did almost a quarter century ago. Bilateral trade between Iran and Russia represents a much greater potential than cooperation between Iran and Azerbaijan, although none of this is zero-sum. Economic interests are usually at the basis of inter-state relations. With a successful P5+1 agreement, Iran might not transport all its gas via existing Azerbaijani pipelines knowing that a pipeline through Armenia (i.e. Gazprom) may be more economically interesting. If the rivalry between Sunni and Shiite sects is not an illusion, Iran might reject Turkish gas transport routes altogether. Israel has invested heavily, militarily and otherwise, in Azerbaijan as a perceived front line state. Azerbaijan supplies almost half of Israel’s oil. The region is not a static Gordian Knot, but a complex chess game with constantly changing rules. The much touted project to send Russian gas to Europe via the Black Sea via Turkey has not even broken ground.